‣ In the Timeline view, drag a layer to reorder it and drop it between other layers. If you created a hierarchy on your arms, legs or other body parts, it is possible that you will want a part, such as the hand, to appear in front of its parent. 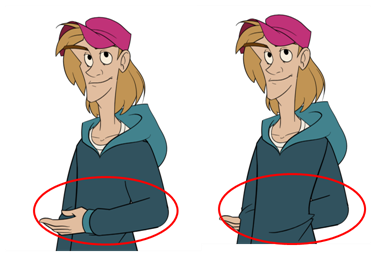 Yet, if you move the hand layer above the arm layer, you will break the hierarchy. 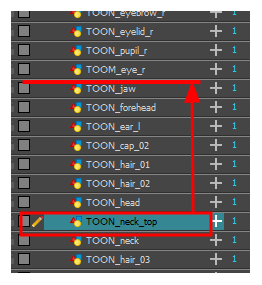 To reorder a layer rigged in a hierarchy, nudge it backwards or forwards on the z-axis. NOTE: You will do the same for the layers that are not in the right order on the extra views. Do not place the drawing on another layer. You want to keep all your drawings of the body parts in the same layers like a box containing all of the hands or all of the shoes. In the same way you create multiplane backgrounds (depth), you can perform a micro nudge of the part to be reordered and see it in front of the other elements, even if its layer is actually behind the other ones in the Timeline view. 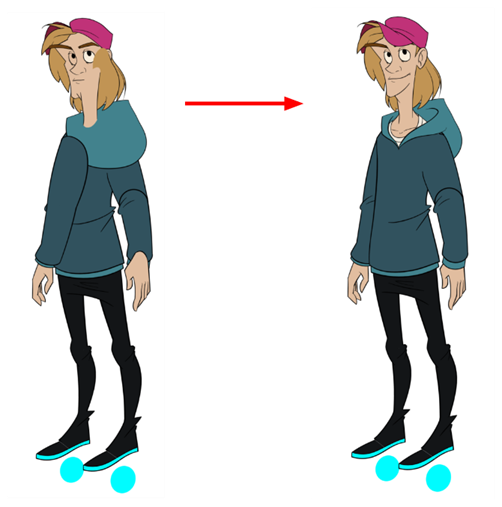 The forward-backward position can also be animated over time. Repeat the following instructions for all the views. In the Tools toolbar, select the Transform tool. Make sure to enable the Animate mode. In the Camera view, select the element you want to reorder. Make sure the focus (red outline) is around the Camera view before selecting the element. To move the element forward, press Alt + Down Arrow and to move the element backward, press Alt + Up Arrow.